Question. How many times have you watched UK releases of films with subtitles that are using American words like color or humor. So why would the titles be any different? Well first off, I don’t use sub’s so that point is kinda moot. Second, I can handle foriegn text on releases, as I have Canadian dual language, Korean, HK, Chinese, Taiwanese, German, French etc steelbooks and all have various text in differing languages, which am fine with. BUT they all (besides one that drives me mad being the alternative Deutsch title) have the correct, English title, somewhere, as that’s what most important for me. For us brit’s, if ‘Basil’ is abscent from this release, then it’s wrong. Plain and simple. And it still breaks me when I see those words spelt like that. It’s one thing Americans having their own words for things, that’s fine, it spelling things wrong(as bad a speller as I am too...) just, no. You'd be astonished how easy proof readers miss stuff that hits the streets. I've seen some crackers over the years. Is all this bashing of American grammar payback for last weekend’s moon landing debate? Just a heads up. This and Rescuers 2 will start being charged for soon. 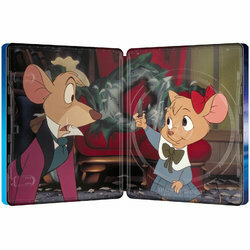 So is there truth to the Zavvi won’t ship B region movies internationally talk? I don't think so. You can now order Bolt to be shipped to Canada. @Wreck said it was a glitch and got it sorted out. I don't know if you were specifically referring to this title but this is Region Free. It may have been answered before, but why have they taken "Basil" off the title? 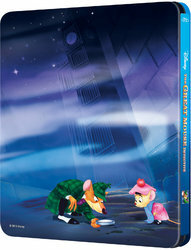 The blu-ray amaray and all releases before it have Basil on. Is it a European thing? If so, Brexit couldn't come sooner!!!! I wasn't judging... but it is funny how many Brits confuse Europe with the European Union. After Brexit you might not be a part of the EU but unless the British isles float away to the Americas you're still very much European. 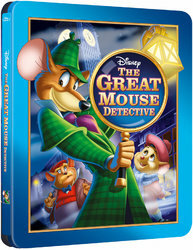 But back to the topic at hand, the official title in Spain is "Basil, el ratón superdetective", which translates to "Basil, the superdetective mouse", which is pretty much the same as your title in the UK. Basil also in the title in Norway. The artwork on this is the same as the US amaray, including the title. It might have something to do with not changing the title on the artwork? But it’s just lazy if that’s the case. I feel for you guys in the RoW, but as a US citizen I’m all for not having Basil in the title.